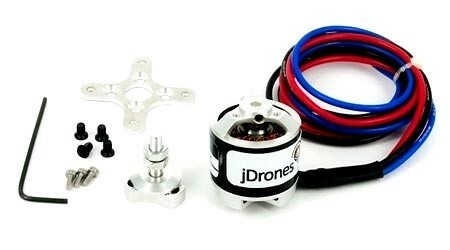 This is the new 850Kv 2830 High Efficiency motor, it's the latest motor to come from the Jdrones team. The 2830HE motor has been developed and tested for over 8 months, designed for use on multi rotor copters, the 2830HE directly challenges the well known AXi 2217/20 multi rotor motor. The 2830HE motor has an aluminium propeller mount that really keeps the propeller locked in place, the shaft size is 4mm and its locked in place with 3 hex screws to the main body of the motor. Every 2830HE motor has to pass a new test program that includes physical tests on the motor at the factory and then another set of tests at jDrones before the motors are shipped. The 850Kv 2830 HE motors come with a 1 year mechanical failure warranty. Accessories: Propeller adapter (shaft 4mm), Allen key, X mount, mount screws.